If President Recep Tayyip Erdoğan is going to become the single centre of power in Turkey, he must crush his domestic opposition and the PKK, and with its refugee deal, the EU is helping him do that, writes George Friedman. On Monday (4 April), Erdoğan said that the peace process with the Kurds is over and that Turkey would crush the rebellion. He warned the Kurdistan Workers’ Party (PKK) that either they surrender or they will be neutralized “one by one,” adding that there is no third option. It is interesting that this announcement follows a less than satisfactory meeting in Washington. Erdoğan attended a summit on the nuclear threat in Washington along with 50 other leaders. It would have been normal for a side meeting between Erdoğan and US President Barack Obama to be scheduled. Though no meeting was scheduled, the White House press secretary hinted that an “informal” unscheduled meeting between the two would take place. 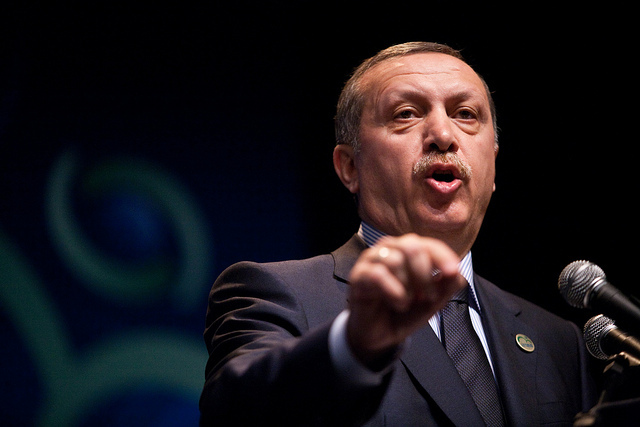 They ended up meeting on 31 March, but earlier that day, Erdoğan went to the Brookings Institution, a Washington think tank, to participate in a panel. He was greeted by hostile demonstrators protesting his policies on the media and other issues. Also present, of course, were reporters. As the demonstrators shouted slogans, Turkish security confronted them and in some cases appeared to shove them. The chaos escalated to confrontations with journalists. It was extremely unusual to have a foreign leader’s security detail engaging demonstrators. That is the job of the D.C. Metropolitan Police and the State Department’s Diplomatic Security Service, which is charged with protecting foreign leaders. The Turkish security officers took the responsibility upon themselves. Unfortunately, as foreign diplomatic personnel, they had no authority to do so. There were two narratives that followed. Turkish media presented the affair as a deliberate insult to Erdoğan – deliberate because no one sought to silence the demonstrators and instead allowed them to insult the president. From the American side, the Turks showed the demonstrators in D.C. the same oppressive behavior they show in Turkey. The demonstrators argued that the behavior of the Turks in D.C. showed just a fraction of their brutality in Turkey. At Erdoğan’s meeting with Obama, the day’s earlier incidents were not mentioned, nor did the White House make a public statement about what happened at Brookings. Neither Obama nor Erdoğan was eager for another fruitless confrontation. So there wasn’t one. Instead, the two leaders had a chance to discuss their favorite topic, on which they weren’t likely to agree, the Islamic State. Obama’s position is that Turkey ought to shift its focus away from the Kurds to the Islamic State. Erdoğan’s view is that engaging IS carries substantial risks while leaving Turkey open to PKK insurgents. The US-Turkish dispute is far more critical than any informal meeting between Erdoğan and Obama. Turkey has been the victim of IS bombings in recent weeks. It has also been the victim of PKK bombings. Both pose a threat. But IS does not pose a geopolitical threat to Turkey, more of a nuisance – if deaths from bombings can be a mere nuisance. IS can’t rip the Turkish state apart. The PKK could. They dominate southeastern Turkey, northeastern Iraq and parts of western Iran, as well as a small portion of Syria. If the PKK can generate a strong secessionist movement, it would lead to a partition of Turkey, and if it joined the Kurdistan Regional Government in Iraq, would create a new nation-state with uncertain power. The likelihood of the PKK succeeding in generating a Kurdish secession is small. But from the Turkish point of view, the small likelihood of a disastrous outcome requires resistance. IS might create a new state to the south of Turkey, but Turkey already faces an unpleasant reality there. Getting caught up in Arab wars drained the Ottomans and is not fondly recalled by the Turks. They are more inclined to let chaos take its course than to directly intervene. For the United States, IS is the core issue in the region now, and since it doesn’t want to deploy major forces in the region, it is seeking regional powers with a stake in the outcome to join in. It is having limited success. The Saudis do not want to activate pro-IS sentiments in Saudi Arabia by intervening. The Iranians have intervened in Iraq and Syria but in neither with overwhelming force. And the Turks, precisely because they live in the region, would rather see some limited accommodation than war. The Turks and the Americans do not see IS the same way. This leaves the US strategy of relying on proxies to fight IS in shambles since the most effective proxy is Turkey. It also leaves Turkey with an interesting problem. It has been in a confrontational position with Russia, ever since Russia intervened in Syria and Turkey shot down a Russian plane. Being simultaneously at odds with the United States seems foolhardy. The Turks obviously believe that neither power can threaten them and, therefore, that they don’t need either one’s protection. The Turks have followed a neutral or pro-American stance since Turkey’s founding. The fact that Erdoğan is comfortable challenging the United States and Russia simultaneously gives us a sense of how he evaluates Turkish power. He sees it as substantial. Erdoğan is presented as part dictator and part madman. He is clearly dictatorial in some of his practices, as his consolidation of power over the past few years shows. But declaring politicians mad is the standard response when they don’t behave the way observers think desirable. He isn’t mad. He understands Turkey’s geopolitical situation correctly. First, Turkey is not yet ready to engage in foreign military adventures. Second, Turkey’s strength makes it immune to foreign intervention. It follows from these two points that Turkey would use this time to handle domestic matters, which include intimidating or crushing political opposition and dealing with the Kurds. Now is the time to guarantee that secessionist tendencies will be eliminated. Erdoğan can’t crush the PKK. However, he can impose costs on it that make its goals even more distant. He can’t eliminate domestic resistance, but he can force it underground and make it impotent. There is a sense that he is destroying Turkish liberal democracy. That is not an unreasonable view. But he is also trying to maneuver away from foreign involvement that might drain his power. If Erdoğan is going to become the single centre of power in Turkey, he must crush his domestic opposition and the PKK. And with the Europeans paying him to handle their refugee problem, he is not isolated from the world. He is not mad. He is quite calculating and logical, albeit ruthless. It will be interesting to watch him rule the EU with Merkel.